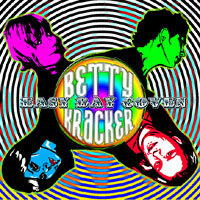 Betty Kracker: Raw Power from East Vancouver! please watch it, 'like' it, share it - spread it around! 05/2011 - Interzone makes Cover of the Week on the Joy Division Central mega fansite! Rhythm Guitar/BG Vocals: lisa e. "...They come on like SLANT 6 mixed with SIOUXSIE AND THE BANSHEES: spooky guitar lines and echo-laden vocals from all four members. It's got a definite SoCal vibe too... some of these songs could fit right in on the SUBURBIA soundtrack! Pop and punk, yet not pop punk, know what I mean?" "...crunchy, delirious punk infused with hectic melodies and sludgy downbeats. ... a flourishing EP that is full of the contorted contradictions and turbulent risks that Betty Kracker pull off flawlessly." "I like all the BETTY KRACKER songs!!!!! The songs are powerful and spectacular!!!!!!!!! The band sounds fantastic!!!!!!" "...It was definitely a chick album, but a decent one." bass undulates and the vocals careen over top of the smartly arranged and well-written tunes." "...Taking their cue from those fine bands (Frightwig, Avengers), and chucking some Crass and X into the mix, Easy Bay Coven serves up a righteous old school Garage Punk smack upside the head. It's good to see some women back in the slam pit." Mix equal parts punk, new wave, pop and rock, blend furiously, and bake at wicked high heat until crunchy! 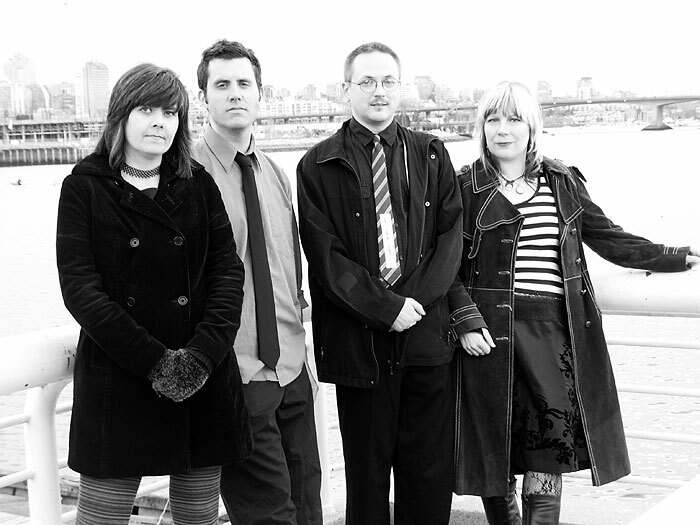 Betty Kracker kicked off their live music takeover of Vancouver in 2004 at FaceFest, at the Railway Club (dozens were slain, appreciation flowed). Dozens of shows in the Vancouver area ensued. The song "S.C.W." was recorded soon after at FacePlant for the Red Cat Records anti-Gordon Campbell (BC premier) compilation Citizen's Rule, released in spring of 2005. The debut ep Easy Bay Coven was released in October 2006 to national acclaim (The Nerve, Exclaim, MaximumRockandRoll, Absolute Underground all loved it). J.T. Massacre (Big John Bates, Slickjacks, ex-Pet Fairies). Shannon and lisa e. continue with new songs and welcomed to the band new members Trevor Thompson (The Rain and The Sidewalk) on guitar, backing vocals and Ryan Schmidt (ex-Salmon Arm, ex-Motorama) on bass. The new line-up debuted at Facefest 2007 on May 26th to a packed Railway Club, and the band has performed regularly through the last couple of years. 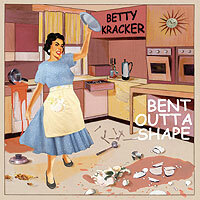 Betty Kracker released Bent Outta Shape in 2008. the seven-song CD moves into more of a postpunk vein, while retaining the punknroll edge. It also contains a kickass cover of Joy Division's INTERZONE, which was named 'cover of the week' on the Joy Division Central website in May! Shannon is recording with Trevor's The Rain and the Sidewalk project, and Lisa and Ryan are recording their own project as well as creating some mind-blowing visual art. No performances are booked for the moment, as Shannon has relocated east. Retailers: Contact mclean records and distribution for wholesale.